You can't deny that they'll look cute as pie in our classic denim look Kids Hipster Denim Short designed for everyday rough and tumble. Kids Hipster Denim Short is rated 4.2 out of 5 by 10. Rated 5 out of 5 by Gigi from Awesome fit!! Bought 2 pairs of these shorts for use on our nelson bay holiday. Moms... They have an elastic waistband and cover the top of the thighs for that hot sun. 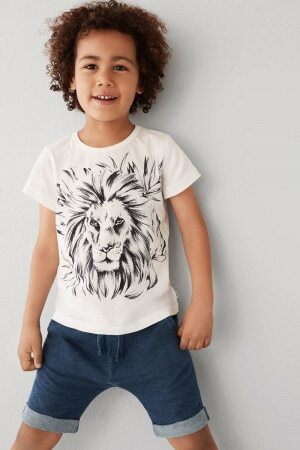 Soft fabric that moves with your toddler. I promise you won't be disappointed. Love you Bond's. My go to brand for kids. Rated 2 out of 5 by Raloh from Waist too big, strings too tight The waist was too big. I thought it had elastic waist band but didn't. It is a draw string pants, but it was way too tight for my 5 year old to pull it. Since he can't pull the strings to tighten it I had to return it. Rated 1 out of 5 by DM87 from Disappointed I bought these shorts for my son a couple of weeks ago. He had not even been wearing them for 10 minutes when I discovered they had a hole in them. Not the good quality that I was expecting. Rated 5 out of 5 by JAM21 from Love these I bought these for my almost 3 year old boy & I absolutely love them on him. The material is soft & colour is perfect for a messy boy. Rated 5 out of 5 by Unhappy Gran from Purchased shorts for my grandson, only wore a couple of times as the machine stitching front and back of short leg cuffs pulled holes in the material. Design has been changed from previous version, and not as hardy material, very disappointed. Rated 5 out of 5 by Jojom from Great shorts, super comfy and great for wear while climbing & jumping around as boys do!